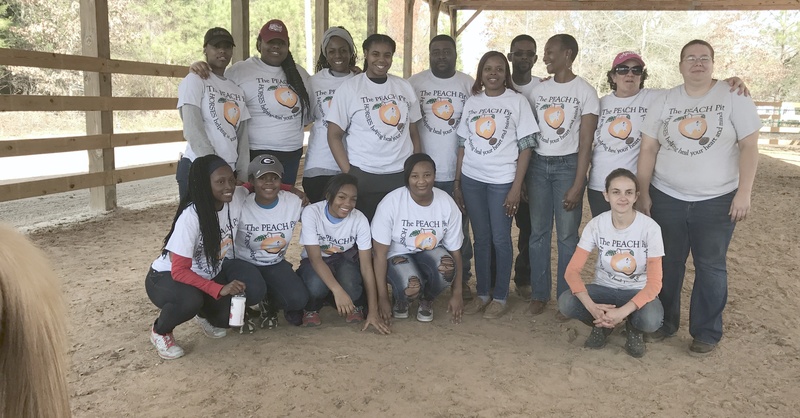 The Martin Luther King holiday weekend is an opportunity for many to give back to their communities, and seven students from Macon were among those who gave back to The PEACH Pit on Jan. 14 for Volunteer Day. In the first hour, the young ladies – no males were there – and four of us “slightly” older ladies had disassembled about 20 corral panels, and then relocated and reassembled them to double the size of the front pasture. Kneeling, from left: Zykerria Hill, Yalandria Derricho, Jessica Wornum, Tiahna Ball and Sarah Meleco. Standing, from left, Mya Foster, Shianne Gibson, Andrea Gibson, Legacy Gibson, Garry Cannady, Demetria Cannady, Garrett Carter, Gwendolyn Coley, Elissa McCaskill and Katherine Hosmer. The girls were the strategists; they figured out the best approach – actually multiple approaches – and we tackled the job. Some worked in pairs, some solo. Lots of chatting and critiquing and laughing. Lots of hard work. Lots of smiles. These young ladies were a late addition to our MLK Volunteer Day. Their “neighborhood mom,” Andrea M. Gibson, left a voicemail for me Thursday after learning about us on a site for the MLK Day of Service. When I called her back, she said she was bringing six girls. When she showed up, seven piled out of her SUV, and she said more girls had wanted to come. Three other volunteers from Valdosta joined us in the second hour, just in time to round out the top pasture and assist with grooming and moving the horses. They heard about us on online social media group for Georgia clinicians and are interested in equine-assisted psychotherapy. Last year, we had airmen from Robins Air Force Base. The coordinator, Jennifer Storms, had received one of our fliers and thought volunteering at our nonprofit would be adventurous. They got the job done … efficiently. They cleaned up debris, pounded stakes, brushed horses, whacked weeds. Good strategists. Not as much chatting. The PEACH Pit’s team this year consisted of one person: a disabled Army Veteran. Lots of adrenaline. Lots of determination. Lots of pain. And Ranger candy (800 milligrams of ibuprofen). 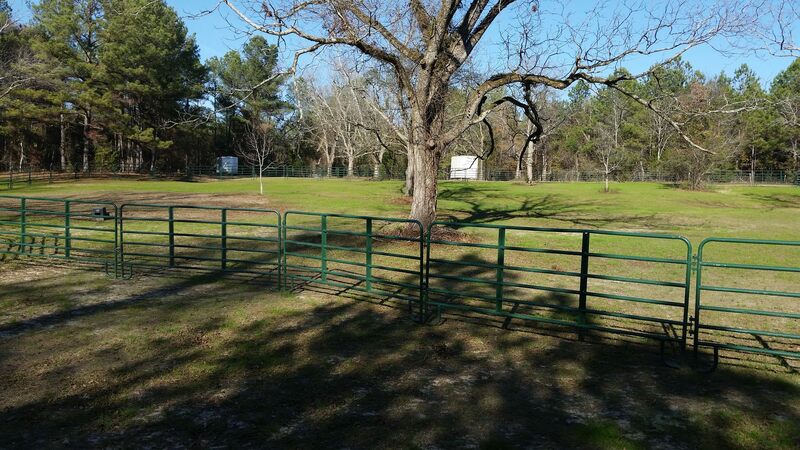 This is what the pasture looked like before the volunteers came out. The video is what it looked like afterward. One thing the two volunteer groups had in common was energy. Young people. Fit people. Energy. Oh, to have the energy of youth. Wait, for the MLK Volunteer Day this year and last year, we did have the energy of youth: Shianne Gibson, Mya Foster, Jessica Wornum, Yalandria Derricho, Legacy Gibson, Tiahna Ball, Zykerria Hill. We had the energy of the young at heart: Elissa McCaskill, Katherine Hosmer, Andrea Gibson, Demetria Cannady, Garrett Carter, Garry Cannady, Sarah Meleco and Gwendolyn Coley. Together, we accomplished much. We accomplish much at each volunteer day, and we generally have one a quarter. Each volunteer day means we don’t have to pay for those services. Not having to pay for those services means we can minimize the fees clients pay for our services. Not paying for those services means your donations allow us to focus our energy on helping our clients. If you’re interested in participating in one of our volunteer days, visit our events page (www.thepeachpitgeorgia.org/events). We always feed our volunteers, and we generally have some giveaways and a demonstration of our therapy model. 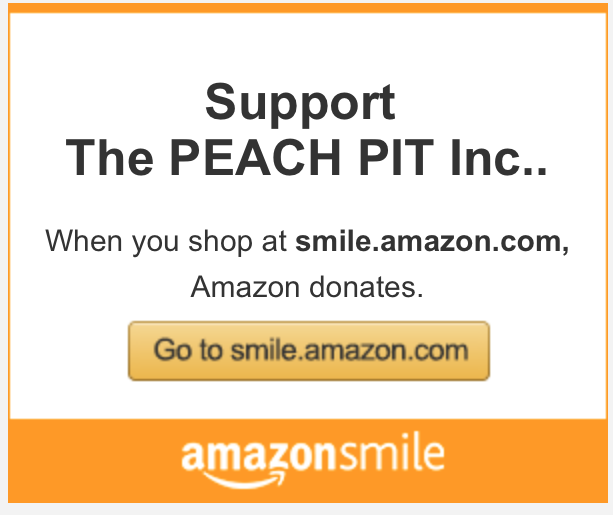 If you’re interested in donating to The PEACH Pit, you can do so at https://thepeachpitgeorgia.org/matching-funds/. The donate button is on the right side of the page. To double your donation, scroll through the list to see if your employer is there. If so, ask your employer to match your donation. The day has been long, exhilarating and exhausting. The girls who volunteered likely still are chatting, critiquing and laughing. The rest of us are likely pooped and in need of rest. Oh, to have the energy of youth. Again. Next volunteer day. This entry was posted in EAP, The PEACH Pit General. The PEACH Pit was so amazing. I had a fun and educational time learning about the horses, especially flight, fright, and freeze. Spending time at The PEACH Pit taught me the connection between horse and humans. Also how we are the same in life. If you get a chance I would encourage others to go experience yourself. What a joy to meet you and the other young ladies. We were quite impressed with your hard work and your willingness to participate wholeheartedly in our demonstration. Be sure to show off your shirts. Ms. Gwendolyn is a very professional and classy lady, especially in her cowgirl boots. Her passion for what she does shows in her spirit and in her desire for others to learn of the therapeutic benefits of equine therapy. Before last week, I didn’t even know that there was such a thing. We are looking forward to volunteering again soon, and are ready to roll up our sleeves and help out. Thanks for a really cool time at The PEACH Pit!!! Thank you so much for coordinating the volunteer group. You’re an inspiration to the young ladies and have helped them expand their ideas of ways to serve.